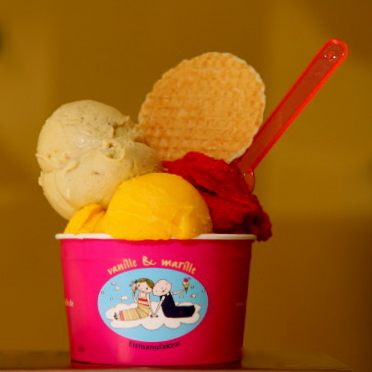 100% natural ingredients, certified manufacturer knowledge and heaps of love make vanille&marille one of the best ice cream joints in town. 20 different kinds and flavors can be devoured in their three Berlin shops during the warm season. The shop owners are always on the search for new things, and thus keep coming up with exciting new flavors like 'Berlin Marzipan with Plum, Chocolate and a Dash of Plum Brandy' or simply 'Lemon + Cinnamon'. Of course, classics like real Madagascan vanilla and yes, real Belgian chocolate are not left out and are just as tasty. And since nothing says 'summer' better than ice cream, I can never have enough - especially not when it's THAT good!